[Ασκληπιός (Gr); Aesculapius (L)] is the god of medicine and healing in ancient Greek religion. Asclepius represents the healing aspect of the medical arts. His daughters are Hygeia (“Hygiene”, the goddess/personification of health, cleanliness, and sanitation), Iaso (the goddess of recuperation from illness), Aceso (the goddess of the healing process), Agl?a/?gle (the goddess of beauty, splendor, glory, magnificence, and adornment), and Panacea (the goddess of universal remedy). He was one of Apollo’s sons, sharing with Apollo the epithet Paean (“the Healer”). The rod of Asclepius, a snake-entwined staff, remains a symbol of medicine today. Asclepius was the son of Apollo and Coronis. His mother was killed for being unfaithful to Apollo and was laid out on a funeral pyre to be consumed, but the unborn child was rescued from her womb. Or, alternatively, his mother died in labor and was laid out on the pyre to be consumed, but his father rescued the child, cutting him from her womb. From this he received the name Asklepios, “to cut open.” Apollo carried the baby to the centaur Chiron who raised Asclepius and instructed him in the art of medicine. Asklepios was married to Epione, with whom he had six daughters: Hygeia, Meditrina (the serpent-bearer), Panacea, Aceso, Iaso, and Aglaea, and three sons: Machaon, Podaleirios and Telesphoros. He also sired a son, Aratus, with Aristodama. The names of his daughters each rather transparently reflect a certain subset of the overall theme of “good health”. At some point, Asclepius was among those who took part in the Calydonian Boar hunt. Zeus killed Asclepius with a thunderbolt because he raised Hippolytus from the dead and accepted gold for it. Other stories say that Asclepius was killed because after bringing people back from the dead, Hades thought that no more dead spirits would come to the underworld, so he asked his brother Zeus to remove him. This angered Apollo who in turn murdered the Cyclopes who had made the thunderbolts for Zeus. For this act, Zeus suspended Apollo from the night sky and commanded Apollo to serve Admetus, King of Thessaly for a year. Once the year had passed, Zeus brought Apollo back to Mount Olympus and revived the Cyclopes that made his thunderbolts. After Asclepius’ death, Zeus placed his body among the stars as the constellation Ophiuchus (“the Serpent Holder”). Some sources also stated that Asclepius was later resurrected as a god by Zeus to prevent any further feuds with Apollo. The temples of Aesculapius were more than places for his cult-worship which was widespread throughout Greece. They were places of healing and so they may be considered prototypes of modern hospitals. The most famous temple of Asclepius was at Epidaurus in north-eastern Peloponnese. Another famous healing temple (or Asklepeion) was located on the island of Kos, where Hippocrates, the legendary “father of medicine”, may have begun his career. Other asclepieia were situated in Trikala, Gortys (in Arcadia), and Pergamum in Asia. In honor of Asclepius, a particular type of non-venomous snake was often used in healing rituals, and these snakes — the Aesculapian Snakes — slithered around freely on the floor in dormitories where the sick and injured slept. These snakes were introduced at the founding of each new temple of Asclepius throughout the classical world. 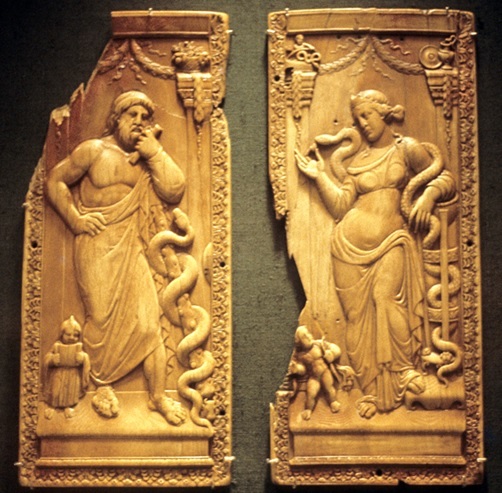 From about 300 BC onwards, the cult of Asclepius grew very popular and pilgrims flocked to his healing temples (Asclepieia) to be cured of their ills. Ritual purification would be followed by offerings or sacrifices to the god (according to means), and the supplicant would then spend the night in the holiest part of the sanctuary – the abaton (or adyton). Any dreams or visions would be reported to a priest who would prescribe the appropriate therapy by a process of interpretation.